Should a newcomer to religion give up the contact to his parents once he became frum ? Many Baalei Teshuva, especially those who are planning to join a chassidic group, are asking themselves this question. Not only Baalei Teshuva but also converts to Judaism. "In case a newcomer (newly religious) is going to join a chassidic group, then he should end the contact with his parents !" No matter if the person in question was born Jewish or converted to Judaism. What is the reason for such a statement ? "When the newcomer's children are going to school with my children and suddenly start talking about watching TV, movies, worldly newspapers or other worldly matters, then this is influencing my children in a bad way". Should a Baal Teshuva continue dealing with parents ? With friends from his past ? Or should he rather look for an entire new circle of friends within his new society ? Especially chassidic groups seem to expect such a cut. When someone decides to become religious and follow the path of Torah - then fine. However, keeping up the contact with the old environment can disturb and influence the whole Teshuva process. And once you made the decision in favour of religion, why bother with "traveling" around in two different worlds ? The reason why the contact should be cut off may sound hard and unfair. Doesn't it say in the Ten Commandments that you should honour your parents ? That's correct but what if the past has extreme negative influences onto the Baal Teshuva ? The biggest problem whatsoever is when a Baal Teshuva has adult children from his former life or children at all. The newly religious face a tremendous amount of changes and challenges once they started their Teshuva process. The religion, the environment and even problems with themselves. New priorities have to be set etc. Not an easy task at all and it surely takes time. I told the Belzer that, according to my opinion, the contact to the parents shouldn't stop totally but take place in a more limited way. Instead of going and visiting the parents or sending the children to them, the parents should rather come to the house of the Baal Teshuva. Who of the religious neighbours wants to see the secular part of the BT's family in the house ? In case the Baal Teshuva lives in a religious neighbourhood. What if the grandmother shows up dressed immodestly ? And do religious neighbours want Gentile parents or adult children in the house ? In case of the convert to Judaism. As soon as Gentiles step into a religious buildings, all the red alarming light are start blinking anyway. If somebody seriously does Teshuva, he isn't even interested in running back and forth towards his past. My own experience is that in case you visit old friends and siblings, their talks and subjects soon start going on your nerves. And I don't mean this in a negative way ! But if you are in a world of Torah and Mitzvot, many other things seem to have no meaning for you any more. As soon as you reach that conclusion, your visits are getting less and less. The most serious problems are being faced by people with adult children. Especially converts to Judaism whose children are from a marriage with a Gentile. Thus, they are not Jewish. I don't think that any Jewish religious society would tolerate the convert walking in with his Gentile children. Walking into the synagogue or to a Shabbat at other people's house. The more people I meet who are more or less actively involved in the Teshuva process, the more I realize how many additional difficulties there are. I agree with you that contact should be maintained on a limited basis and that if the BT/gair is serious it won't be company they want to keep anyway. However I do believe a phone call every so often, to the parents for BT and gairim is a kiddush HaShem. I do not think it would be OK to send the kids off to the secular/gentile grandparents as the atmosphere and surroundings would not be kosher. The BT/gair would need to be there to supervise. However, meeting them for a walk in the park and asking them to dress modestly, etc... I think thats fine. IF the person is so weak to be effected negativly by his parents then perhaps another option is in order. However, for a regular person, whos parents are understanding, I think it would be unfair to never speak to them again. You are right but when I spoke to the Chassid, I got the feeling that it is very hard getting the message over to someone born into the society. I think that the more extreme the group is, the less they want you to maintain contact. 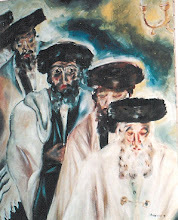 I am thinking here of the Toldot Aharon or maybe even Satmar. I've heard about a convert to Judaism, joining Satmar in Jerusalem and cutting off any contact to his parents. As far as I understood from the Belzer, they (or at least) would tolerate too much contact with the parents. The TA as well as the Toldot Avraham Yitzchak would definitely not accept such a behaviour. I think that when you join those groups, your whole behaviour has to be very different anyway. Compared to them, Satmar is probably easy going. Yes for sure Satmar don't follow the Rebbe(s) as staunchly as TA or TAY. It's a fascinating subject. 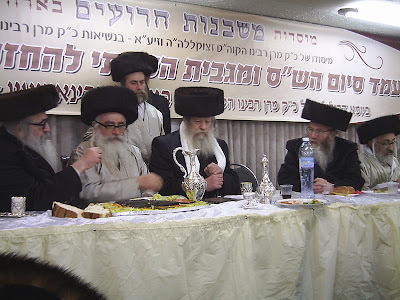 Also wonder if groups outside of the Mear Sharim bubble are more laid back.... maybe London Satmar and Mear Sharim Satmar have different levels of intensity? Even Satmar in Bnei Brak differs a little from Mea Shearim. In Bnei Brak I found them quite open when I went to Rebbe Aharon's Tish. my friend was also saying the "new generation" are much more open and that before it was much harder to come to Satmar. Generally I find Satmar very nice and open people. I find it really sad that you would even ask this question Miriam. These are the people who put you into this world. Sure there are problems, but you find a way to deal with it. I wasn't talking about myself but described the situation of many Baalei Teshuva. I find it really sad that people are so judgemental. "I find it really sad that you would even ask this question Miriam." I can speak from experience. I knew my family and friends would not fit into society when I came to Israel, so I waited until my children were on their own. My family respected my decision. When I visit I bring my own utensils and keep kosher--a bit fussy, but do-able. I pray that my children will be affected by my actions. No, the two societies don't mix, but with planning an a bit of effort it is possible to honor the ones who birthed and raised you. One last thought, by shunning them, what are you teaching them about frum society? It surely is not a positive lesson. This is not a lesson but a realistic view. People joining the religious society usually know about these issues. Should Reform educated adult children reject their parents when the parents become Baal Teshuva? How far is the daughter-in-law (whose mother is a Reform Cantor) suppose to go to accomadate her unbending in-laws? No one should reject anyone. Whether Reform educated children do Teshuva or whether the parents decide doing Teshuva ! It is very important for both sides to work out a way where both parties can live with. It goes without saying that the Teshuva side will not eat in the Reform sides non - kosher kitchen. Even if there is a kosher kitchen, the Teshuva side may have its own specific Halchot for keeping kosher. Meaning that a kosher kitchen is not always a kosher kitchen for everybody else. This should not be taken as an offence and I know many frum Jews who would never eat in my kitchen. I also know frummies who don't even eat anywhere outside but only in their homes. How far should each side go ? I think that it is important to sit together finding a compromise each side is happy with.